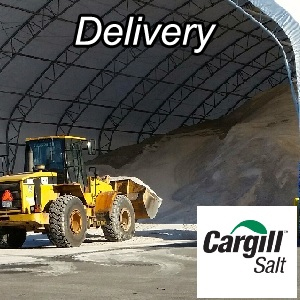 Bulk salt, bagged salt and sidewalk material. Call for large volume discounts on bagged material (mix and match 18 pallets or more) or for large volume discounts on bulk. Please contact us for wholesale / contractor pricing. Sold by the ton. Minimum 20 tons for delivery. A cost effective product for melting snow and ice on roadways, highways, parking lots, and bridges, rock salt is a reliable recommendation for winter road deicing. Treated with YPS (yellow prussiate of soda) anti-caking agent to help resist caking and prevent clumping, Cargill’s bulk deicing salt is a standard for winter maintenance deicing programs and requires less spring cleanup than sand or other abrasives. Available for delivery with a 20 ton minimum plus freight charges. View product MSDS (Material Safety Data Sheet). No minimum quantity for pickup. Sold by the ton. 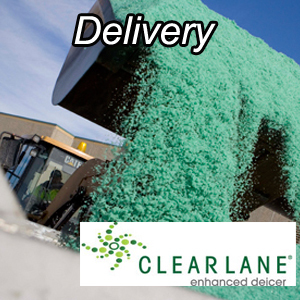 ClearLane® enhanced deicer is a pre-wet sodium chloride made from a patented liquid magnesium chloride formula and mixing process. Combined with pre-wetting and deicing agents, including a PNS-approved corrosion inhibitor, a coloring agent, and a leaching inhibitor, ClearLane® enhanced deicer is a superior deicer for effective winter road maintenance that’s anti-corrosive, better for the environment than traditional road salt and an alternative to road salt. 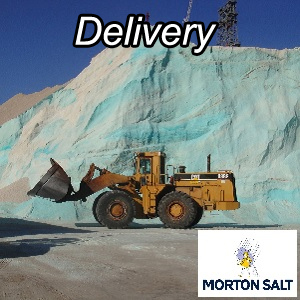 Morton Bulk Safe-T-Salt is your solution for clearing roadways and keeping your community moving during the winter. It is treated with yellow prussiate of soda (YPS) for long term protection against caking and freezing. Morton Bulk Safe-T-Salt is rock salt (mineral sodium chloride) that is direct-mined from natural deposits and then further processed for end use specifications by crushing and screening. Morton Safe-T-Salt Rock Salt effectively melts ice and snow at a lower unit cost than many blended ice melt products. When you need dependable ice control within a budget, you can count on Morton Safe-T-Salt. Salt has been used for decades to help control ice and snow when winter weather strikes. Morton Safe-T-Salt provides a tried-and-true melting solution at lower cost than other specialty ice melts. Available in a 50 pound bags and pallets (49 bags), picked up in Berea. 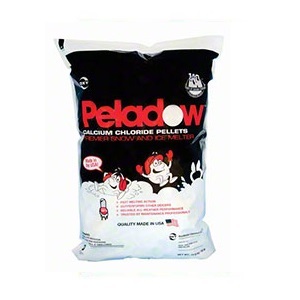 With 90% calcium chloride, is penetrates ice up to three times faster than competing materials. Works down to -25°F. Breaks the bond with pavement faster. Creates brine faster, giving melting action a head start. Attract moisture from its surrounding, speeding up the melting action and the creation of brine. In the first 20 minutes at 20°F, it melts approximately 2x more than rock salt, 3x more than magnesium chloride pellets, 3x more than urea, and 7x more than potassium chloride. Their round shape enables them to bore downward through ice up to three times faster than flat or crystal-shaped ice melters, which melt sideways across the ice, slowing penetration and melting. An ice melter’s speed depends on how easily it attracts moisture from its surrounding, speeding up the melting action and the creation of brine. Brine lowers the freezing point of water and melts snow and ice on contact. Available in a 50 pound bags and pallets (56bags), picked up in Berea.